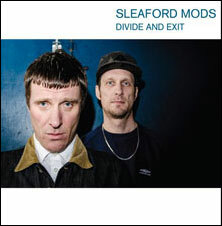 ‘Divide And Exit’ sees Sleaford Mods once again released on the elusive Nottingham-based low-profile Harbinger Sound label. "Divide and Exit " contains 14 new tracks all written over the last 12 months and the result is as immediately in your face as its vicious predecessor. Whilst Fearn's beats and loops will pull you up into the urgency of Sleaford Mods they also allow you to run the gauntlet from deliberate clumsy dance-floor swaggers to full-on punk throwabouts with them. Williamson is let free to spit out his unempathetic litany of bile and anger towards the bloated and tedious. 9. Under the Plastic and N.C.T.